The giant golden mole is about 20 cm (8") long and weighs up to 538 g (19.2 oz). It lives mainly in larger forest patches, although it sometimes occurs in adjacent grassland habitats. The greatest abundance of the giant golden mole occurs in those forest patches having soft soils, well-developed undergrowth and deep litter layers. The giant golden mole makes numerous hills 40 - 60 cm (16 - 24") in diameter and about 25 cm (10") high in which there are openings to the tunnels below. This species is nocturnal. It emerges at night from the underground chambers and tunnels it inhabits to forage. The giant golden mole is endemic to South Africa. It has been recorded from indigenous Afro-montane forests in the Eastern Cape Province from East London northwards along the coast to Port St. Johns, and inland to Amatola and Kologha Mountains near King Williams Town and Stutterheim. It is locally common but with a clumped distribution. Although recorded from 17 localities, the giant golden mole is possibly locally extinct at many sites, and it appears to survive only in larger patches of forest. It does not occur in commercial forestry plantations which abut, or have replaced, many of the remaining patches of natural habitat. Major threats include habitat loss due to fragmentation of forests, which is ongoing in coastal forests as a result of urbanization (East London district) and ubiquitous coastal tourist resorts. Another major threat involves the degradation of remaining forests as a result of forest clearance, collection of firewood, barkstripping, cutting for construction, and livestock ranging into the forest and overgrazing. The giant golden mole is about 20 cm (8") long. It weighs up to 538 g (19.2 oz). 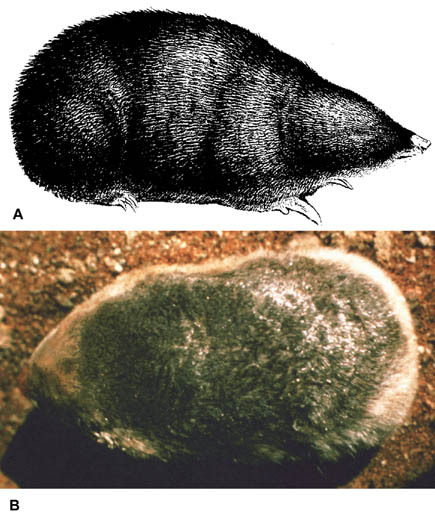 The giant golden mole is found in the Maputaland-Pondoland-Albany Biodiversity Hotspot (Cons. Intl. 2005) .